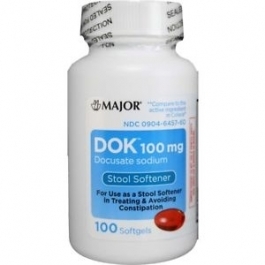 Relieves occasional constipation (irregularity). Generally produces bowel movement in 12 to 72 hours. Take only by mouth. Doses may be taken as a single daily dose or in divided doses. Adults and children 12 years and over: Take 1 to 3 softgels daily. Children 2 to under 12 years of age: Take 1 softgel daily. Children under 2 years: Ask a doctor. Docusate Sodium 100 mg, edible ink, FD&C Red #40, FD&C Yellow #6, gelatin, glycerin, polyethylene glycol, propylene glycol*, purified water sorbitan, sorbitol.